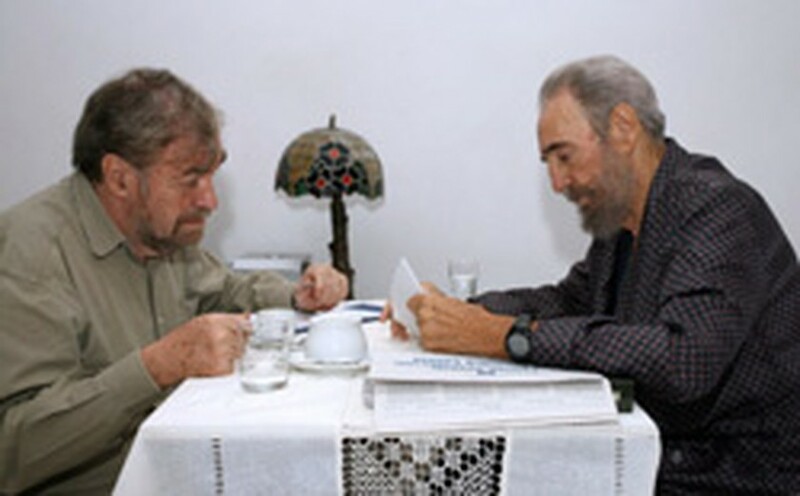 Cuban President Fidel Castro (R) talks in hospital in Havana with Argentine congressman Miguel Bonasso, the personal representative of Argentine President Nestor Kirchner at the NAM summit, September 13, 2006 . Cuban leader Fidel Castro made the first appearance on Wednesday since he fell ill in July when a Cuban TV station showed photos of him chatting with Argentina's famous writer and legislator Miguel Bonasso at his home. The TV program "The Round Table," showed the 80-year-old Castro, who underwent surgery in late July after suffering gastrointestinal bleeding, talking with Bonasso about the release of the second edition of the book "One Hundred Hours with Fidel." The book, written by French journalist Ignacio Ramonet, will be given to all delegations participating in ongoing Non-Aligned Movement summit scheduled for Friday and Saturday in Havana. President Castro and Mr. Bonasso also talked about a free eye surgery program for poor people, primarily from Latin America and the Caribbean. Bonasso, who heads the Natural Resources and Environmental Commission of Argentina's Chamber of Deputies, presented President Castro with a travel bag as a gesture of confidence that the Cuban leader will continue to travel. President Castro thanked Bonasso for his visit and firm support for Latin American integration projects. Earlier, Cuban Foreign Minister Felipe Perez Roque said President Castro is recovering satisfactorily, but added that he is not certain that the Cuban leader will attend the summit of the non-aligned countries.